Hey all. Apologies for the sporadic posts lately. We're approaching deadline time here at work and things are getting hectic. And by hectic I mean I'm preparing to sleep less than a couple hours a night before this coming Monday. Enough whining out of me, though. Today's outfit was so comfortable, like a painter's smock. The flow of the cardigan and the gem tones of the top underneath made me feel, well creative. I suppose that's a very uncreative way to express myself but you get the picture. I felt like picking up a paintbrush, tying my hair back and throwing buckets of paint at a wall. Instead, I had to settle for sitting in front of a computer and taking a quick road trip with the boss for around town errands. 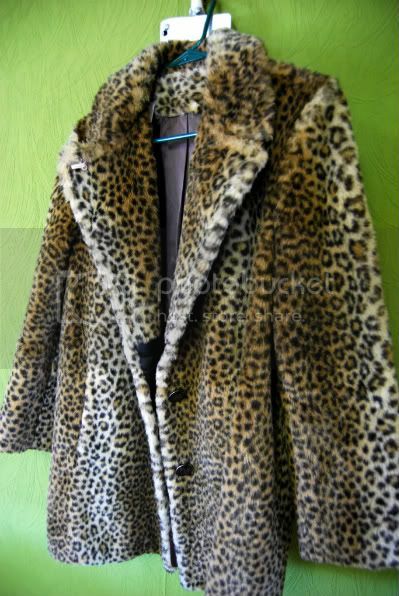 En route, I picked up this AWESOME leopard print faux fur jacket that I have been coveting on everyone else's blogs lately. I think I might be living in it this coming winter. GLAM. I think I pretty much require that cardigan. WHY ARE YOU SO FABULOUS?! Mmm, very painterly. Those shoes are fab and I love the slouchy ponytail. Good luck with the busy-ness at work! Get your fedora and you'll look like a pimp in that new coat. :) Instant halloween costume! Your outfit looks so comfy. And bomb jacket. For reals. I love your outfit! 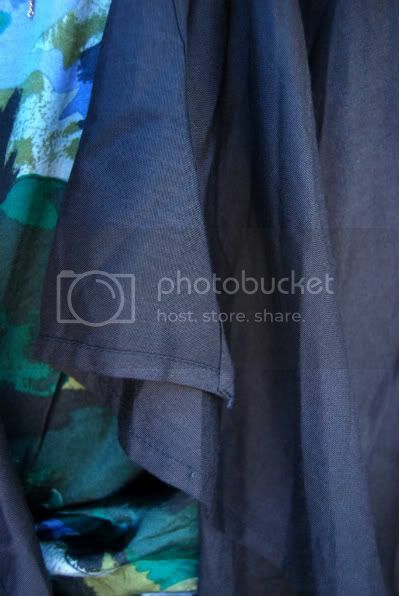 The print of the blouse reminds me of Monet. I am so jealous of your new jacket. I have a jacket just like that, and I wear it way to much. You are gonna love it! Oooh the colors are so lovely! Great outfit. i'm jealous at the coat! it's wonderful. and beautiful top! great look as always! I love the rich blue colors on you. the cardigan is just lovely, very flowy and feminine. nice! That is an amazing drape of a cardigan! 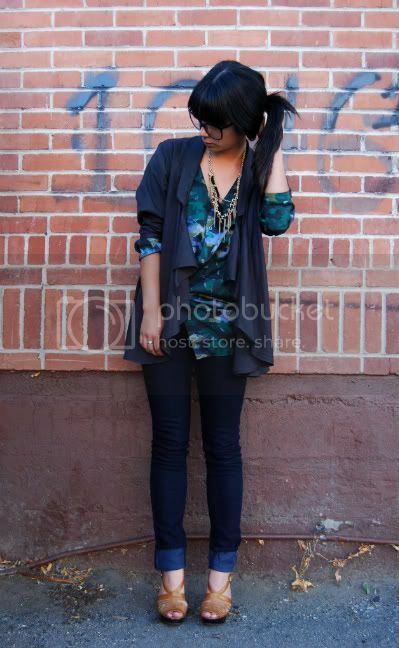 I love the flowy quality of the cardigan! the colors on that top are amazing. they look so good on you! the styling in this outfit is perfection and i can't wait to see how you wear that coat! I am in LOVE with this outfit!!!! that jacket is the BEST.